Potassium Permanganate (Model HCZK) These filters remove granular potassium permanganate for gaseous contaminants including hydrogen sulfide, sulfur dioxide, formaldehyde, ethylene, mercaptan and alcohol; applications include cold fruit storage, compressor intakes, exhaust systems and general HVAC applications. Honeycomb filters are constructed of corrugated kraft cell and surrounded by a metal frame of 0.016 aluminum, sealed with a dextrin adhesive. The media is held in the cells with a nylon tolle grill, and adhered to the cells with PVA. These filters can be manufactured in thicknesses of 3/8” 1/2″, 7/8″ and 1-7/8”. Honeycomb filters are not recommended for use in high humidity applications. 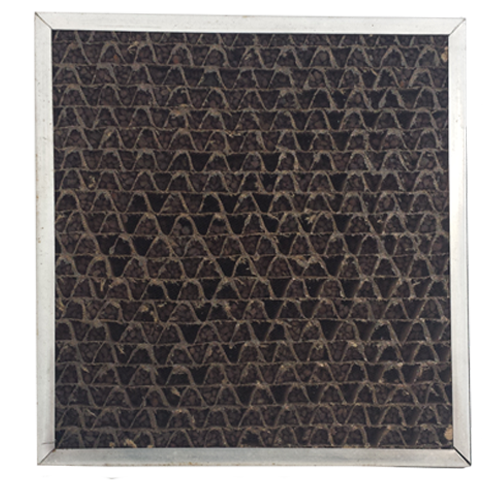 High density granular activated carbon in a disposable honeycomb air filter will control odors and fumes in commercial applications.